One of the greatest sharpeners ever designed this little gem can sharpen almost anything if you know how. Chisels, Plane Irons (Yes! 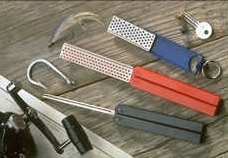 ), Chefs Knives, Garden Tools, Scissors... The list is almost endless! 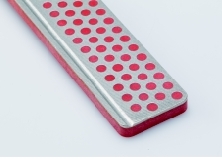 If you have a Mini-Sharp® with you, you’ll never be stuck for sharpening something! 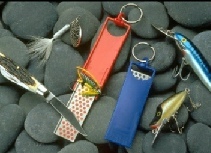 Mini-Sharp® with Key Ring. Folds open and folds shut. 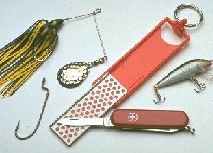 Angler Mini-Sharp® with Key Ring. Folds open and folds shut. 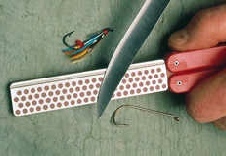 Angler Mini-Sharp® (Red) Fine 600 Grit. Angler Mini-Sharp® (Blue) Coarse 325 Grit. Mini-Sharp® (Green) Extra Fine 1200 Grit. Mini-Sharp® (Red) Fine 600 Grit. Mini-Sharp® (Black) Extra Coarse 220 Grit. This Kit will help you achieve razor sharp edges.